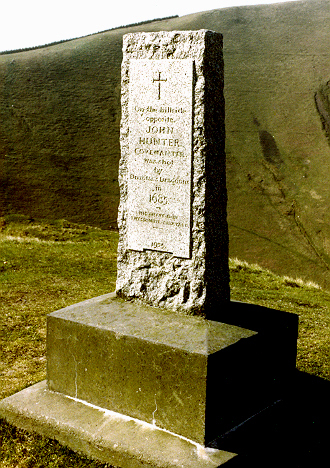 The monument is located by the side of the main road alongside the Devil's Beef Tub. John Hunter lived at Tweedsmuir and was pursued by dragoons under Colonel James Douglas. He was shot in the Devil's Beef Tub, a deep natural depression, in 1685. His body was later interred in Tweedsmuir kirkyard (Peebsleshire), where three stones commemorate him.